This is another one of the more difficult countries in my opinion. 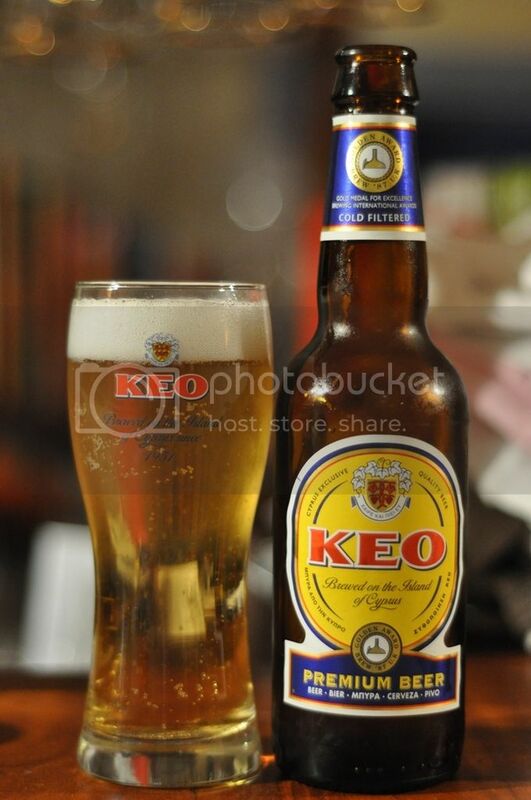 Dad recently went to Greece and I asked him to try and bring one of these back with him, he failed! It's apparently hard to get in Athens, immediately I thought Cyprus was going to prove very difficult to find. 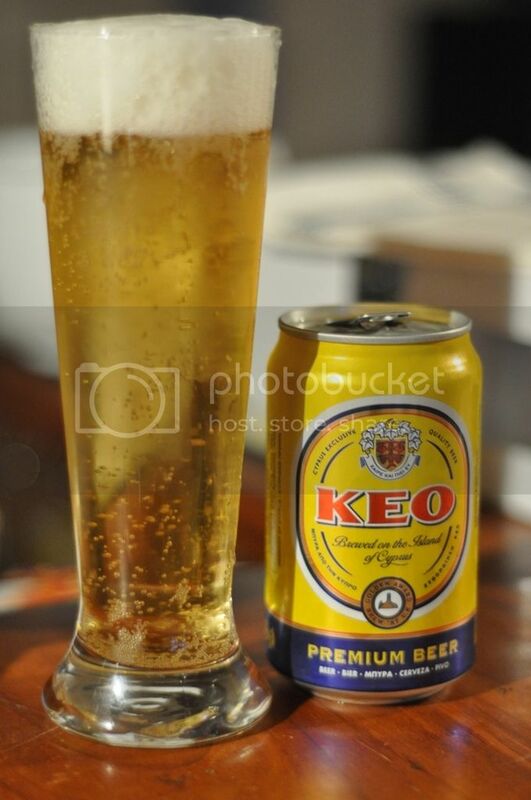 I then walked into the bottleshop near work yesterday, and there was a 6-pack of Keo in the fridge! The Cypriot beer market is dominated by this beer and by imports, mostly Carlsberg. According to people I know who have had this on tap, it is one of the better tap lagers in the region. I find this hard to believe as Efes is a magnificent tap beer from Turkey, if this is half the beer that Efes is I will be very impressed. Firstly, the can is excellently weighted and makes for a fantastic pour. The beer is a light yellow colour with a big fluffy white head. The head retention is excellent and it laces the glass superbly, like any good pilsner. It seems very carbonated with a large number of bubbles floating through the beer, in some respects it reminds me of a champagne in appearance. This beer does not have alot of odour, basically it smells like a standard lager at first. When one takes a deeper sniff and tries to find specific things to tell you about reveals a little earthy malt. There is a little zesty lemon and comparatively high levels of acetaldehyde (apple smell). Quite a standard lager smell if not a little weak. After one sip of this beer I knew I had found a good one! This is a very crisp, light refreshing lager. The beer reminds me very strongly of Stone & Wood's Pacific Ale. This is probably due to the high levels of acetaldehyde and the citrus character of the beer. The malts fill out the beer towards the end of the mouthfull but the almost sour apples definitely steal the show with their crisp bite. The beer leaves the mouth wanting more, and I think it's this reason that I'm 4 cans in and about to start the 5th upon writing this review. All in all this is a really nice lager. In saying that I feel it is quite unique in the sense that I have never tasted a lager with so much apple flavouring, it's almost like a cider. As I'm finding out tonight this is a highly sessionable beer, and so if I can find it in a slab I certainly will be buying some more for beers around the pool this summer. If you see the beer I highly recommend you buy it, especially as I got my 6-pack for $9.90! !